Gotcha team junior, thoughts about Pam being Plumm? Matthew and Milly, opinions on fish? Female FC's, how would you react to becoming a mermaid? It's okay if you can't answer this right now. yes!Even if Knuckle acts enthusiastic to Carol,she still feels disgusted to Knuckle. Mike:daaamn..my dash made Pam appear,huh?That's fortune. Kelly and Jim:KEEP YOUR MOUTH SHUT,BIG BOY!! WE'RE QUITE REGRETFUL 'KAY!? The M siblings:Eew,it smells bad. Freezeria siblings, opinions on Cody? Alice:Fabulous!Sign me in,I want to know about that bad boy!I adore that Cody has a strong side.cOOOL! Elliot:Woohoo!The same goes Alice!Big sis and I are literally matchy matchy. Kelly:At least Jim actually acts serious when working,he knows a lot about laws,understands how to keep the case faired,and he will never let any criminal goes.But once he's not working,he weirdly becomes....pfft...mhuahuahua! !Quite silly,simple,and naive but definitely cute! Mike:woah Kel,you know Jim more than I do,huh? Kelly:I'm good at survey people's personalities..By the way,little fact:Jim has a Quinn mode,but only when he's judging! hAHAHA!! Jim, does everyone called you cute? Knuckle, opinions on your cousin's attitude? Jim:No!Only my female friendos call me like that.Well...ugh..Especially Sam and Alice. Milly:I'm trying to convince Carolina to join my video,but how difficult it is! !She seldom walks around and easily denys everyone''s question in a mean way! Gotcha Team Junior:We'll support Rosen,too! Knuckle:Well!I now hate her.I used to be enthusiastic to Carol,hopefully she will friendly say hello.But that's surprised!“You look like a fool that's hit by love,but unfortunately you'll never find any love interest,for you're short,furious and foolish,boo!”That was what she only roughly told me all the time.After that,I got more and more tired of her,even if she has the most beautiful face in the Flipverse!! 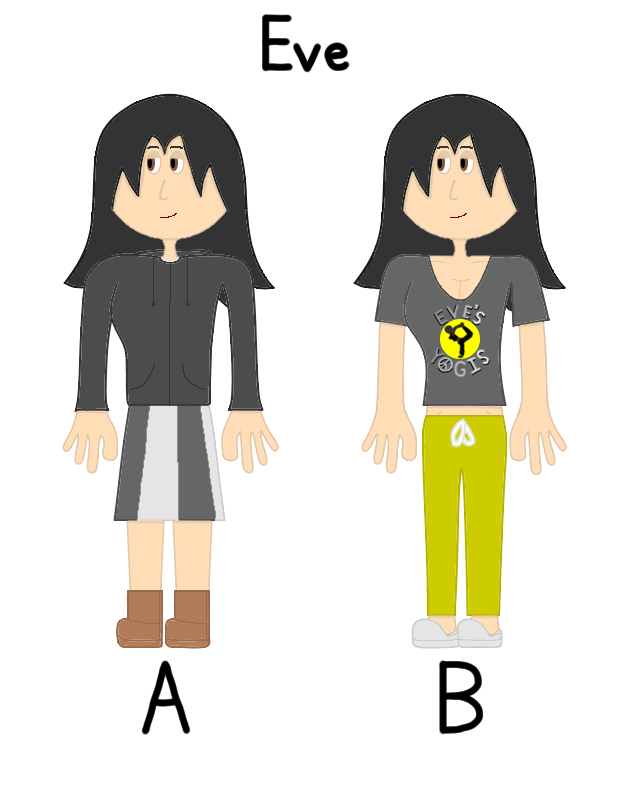 Odea and Eve: Alice and Jenny, opinion on us? The Freezeria Twins:They..re cool.They both look active in our view. Odea: I combine fitness with Latin dance. Wanna dance with me, Alice? Eve: I do yoga. Care to join me, Jenny? Alice:Aw,sorry Odea!I do the same job with Lisa,and I can't dance.But hey,Jim's good at latin dance move,you should ask him to join!Best choice. Odea: Jim, you wanna dance with me? Eve: Namaste. We will start with the child pose. Also, Alice, do you run marathons? Knuckle, is there a reason why your cousin's like that? Any times she's nice? Mike, how do you met Rosen? All, what is the worst thing Carol did to you guys? Jim:Of course!But first,I'll change my dance suit. Alice:Yes,but seldom.I prefer lifting and jogging! Knuckle:Hmmm..I don't think there is some reasonable reason.Well,she has a lovely family,and she grew up healthily and happily.But I don't know why! Carolina:(Meeting new persons)Heh,what a fat.That guy is too skinny!The girl right there crys all day,how “crybaby”she acts! Kelly:Well,here're some words.she always thinks she's the most perfect and that's why she keeps picking up people's defaults.If Carol gets impatient as well,her language would be poisonous!I'm also one of the victims.Samurai's 999999 times ruining would be much better than one insult of Carol!!!AAAAAA!! Mike:We met each other when we were college roommates!We soon got along well once we knew each other.It's been many many years. Knuckle, do you try to change your Cousin's ways? Randy, any funny memories you had back in Munchmore? Milly, is your video done or not? Orchids, opinions on Venus and Mercury?